I was in the garden early this morning, the very best time to be out there, enjoying the collared doves’ soft cooing between bursts of raucous squealing from the circling herring gulls. Whilst ducking down into the entrance of our undercroft for tools I spied an enormous bumble bee clinging pathetically to a pile of black plastic pots. At first it seemed she, surely a queen, was beyond salvation. Thinking such a splendid creature deserved to feel the sun on her wings again, I transported Her Majesty up into the light and positioned her carefully on the first bloom of Dahlia ‘Marie Schnugg’. 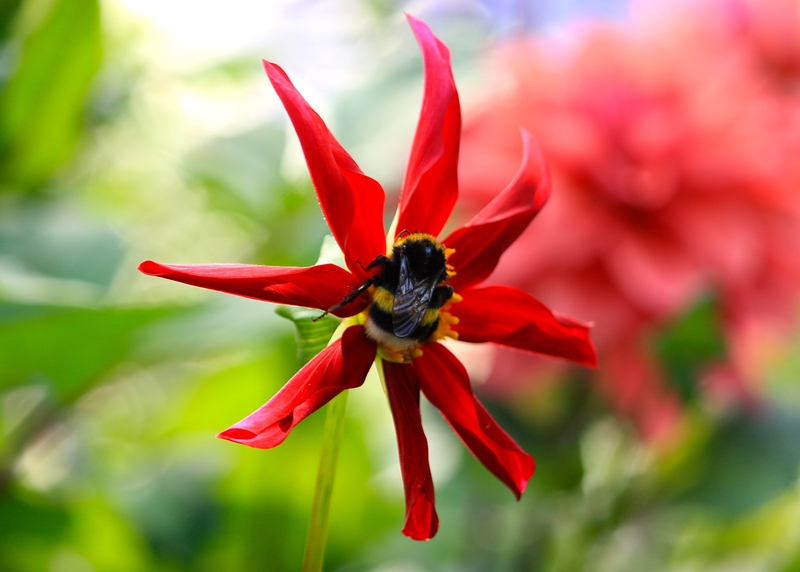 Thank goodness the glossy bud had opened overnight as it’s the only single dahlia I grow, and by far the most appealing to pollinating insects. After a stumbling start Queen Bumble tucked in, scouring every millimetre of the flower’s golden centre for nectar. Whilst she was moving at a stately pace I was able to study her magnificently striped thorax, athletic legs, jet black eyes and tiny wings. They looked about as inadequate as a thong on a weightlifter. How she became airborne I will never know. After 30 minutes, and amusingly by sliding down the flower’s stem like a fireman’s pole, she had a brief rest on a leaf and mustered energy enough to transfer to a neighbouring agapanthus. The pale blue trumpets bowed under her regal weight. After a few more sips she was off, cruising slowly through the air like a furry zeppelin, up into the summer sky, returning to her loyal subjects. On reflection I wonder if when I found her she was asleep, or resting her eyes in the manner of Him Indoors, but my instinct was that she was exhausted and ailing, ready to abdicate. Either way she seemed to respond well to my humble resuscitation attempts and, happily for me, lived to fly another day. What a lovely story. Incidents such as these make up for the sad ones, such as when I trod on a snail the other day at Holywell. You are welcome to come here and tread on as many snails as you like. I will not be sad!